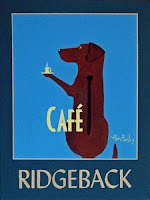 This is my most recent Dog of The Day "Café Ridgeback" Like all other Dog of The Days, it measures 14" x 11" and is an original painting on gallery wrapped canvas. It is ready to hang. This is my first Rhodesian Dog of The Day. 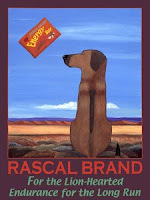 It's based on my larger commissioned painting "Rascal Brand Energy Bars - the image above. Rascal (a very hansom boy) was the beloved friend of Patricia Powers of Northern California. Rascal died a few years ago, but I hope the painting makes her smile today. Later the painting was altered to read "Rhodesian Brand" - top image - so people will be looking and smiling at Rascal for many many years and Rascal will remind them of their pup.